Owen O'Toole is a Los Angleles based composer, often working with film, who has worked with many projects, including Wet Gate, the all 16mm Projector Ensemble, who we presented with Sound Unseen in 2001. I interviewed O'Toole around this same time. Check out the Some Assembly Required interview with Owen O'Toole HERE. This Q&A is a good way of of updating that interview, as he has of course continued working in the meantime. He managed his own record label for a period and of course had his own radio show(s), in addition to creating film and audio collage with groups and as a solo artist. He has many websites, pointing to many projects. Check out his super8 film collaboration, A Filmers Almanac, the 16mm Projector Orchestra, Wet Gate and his Blog, to name just a few. *Are there any additional names used to describe this project: I currently use my given name as a solo artist, although I collaborate on an ongoing basis with other filmmakers and sound artists. Wet Gate is an example of one of those collaborations. Synapse Octet is another, with Charles Kremenak and John Reily using multiple super8 projectors. Wet Gate was founded by myself, Peter Conheim and Steve Dye after we all helped build a performance for someone else. *Do you use a pseudonym? - I participated in various Festivals of Plagiarism and/or Festivals of Beef (protests against US wars). *Tape manipulations, digital deconstructions or turntable creations: I do sound collage hybrid of found materials and music/sounds I make myself. *Location: I am in the Los Angeles region trying to work as a composer/sound designer for film and television. *What is your creative/artistic background: I'm a visual artist, drawing and film, first. Got into doing radio programs in Boston and I tired quickly of playing sets of music, one song after the next. I began making tape loops and using tape delay effect which grew into my personal form of sound art. 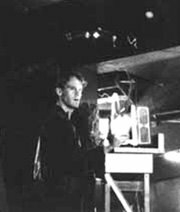 Also studied with sound artist and filmmaker Richard Lerman at the Boston Museum School (1983-86). He's a wonderful guy who encouraged me to develop my own methods. *History: In some ways all of my sound work is an extension of the radio shows I did on and off for 15 years. I studied experimental music and film, began making my own work involving sampling and "process,” altering found sounds into new work, often involving slowing sounds down. A typical radio involved a few intro recordings and then beginning to mix sources, create looping patterns and record that on reel to reel; the halfway point of the program meant turning the tape over to mix the backwards first half of the night with ongoing forward motion, a kind of time stretch in 2 directions. Did many collaborative radio shows over the years. I have not fully moved into the digital/virtual sound world, still using table-top electronics, although I cut in ProTools. I'm a bit of a Luddite and resisted getting sucked into computer use as long as I could. I was also in a short lived group called Loaf of Wonder with Hahn Rowe (Hugo Largo, Foetus) and Jake Dillon (who played amplified electric football games) many years ago. Hahn also encouraged my use of tape loops and general sound exploration. *Motivations/Philosophy: To be alive at a time when so many modes of expression and communication exist is a wonderful thing. At the same time it is bitter sweet to see humanity sucking the life out of the planet, destroying so much of the natural world around us. *How would you like to be remembered: I always hoped to produce great work that would awaken people to the beauty and wonder in the world and maybe lead to lives lived more sensitively to the fragile balance of life on Earth.